Events: Masters of Social Gastronomy do Chinese Takeout! @ The Brooklyn Brainery, 190 Underhill Ave.
Every month, our MSG lectures take on the history and science behind some of your favorite foods. Up this month: Chinese takeout. Chinatown is perhaps the only neighborhood in New York where $1 can get a full meal; a century ago, the same was true of Chinatown’s chop suey houses, whose entrees were considered exotic by droves of hungry New Yorkers. At this month’s MSG, Sarah will cover the history of Chinese take out, from dim sum to tea houses to the Jewish connection to Chinese food. Soma will reveal the stories behind our modern American Chinese food experience, from the man behind General Tso’s to who put the magic in your fortune cookie. We’ll also take a step across the Pacific to see how American food adapts to the Chinese palate: what happens when Colonel Sanders meets General Tso? And! We’ll be raffling off a copy or two of Diana Kuan’s The Chinese Takeout Cookbook. More than 70 years ago, on an unassuming street corner in Brooklyn, a cafeteria operated on the bottom floor of a red brick tenement. Its location across from the Navy Yard made the diner a great success during the hustle and bustle of World War II, but business started waning as the Yard’s workers were laid off in post-war peace. The owners, Ben and Betty Eisenstadt were losing money fast; until, as the story goes, Mrs. Eisenstadt got the idea of using a machine designed to fill bags of tea to fill packets of sugar. No more messy, open bowls on the table; sugar could be sold in individual packets. Betty was also a chronic dieter, and the combination of her brains and her waist begat Sweet ‘n Low, the first artificial sweetener marketed as a fat-reducing aid to the general public. 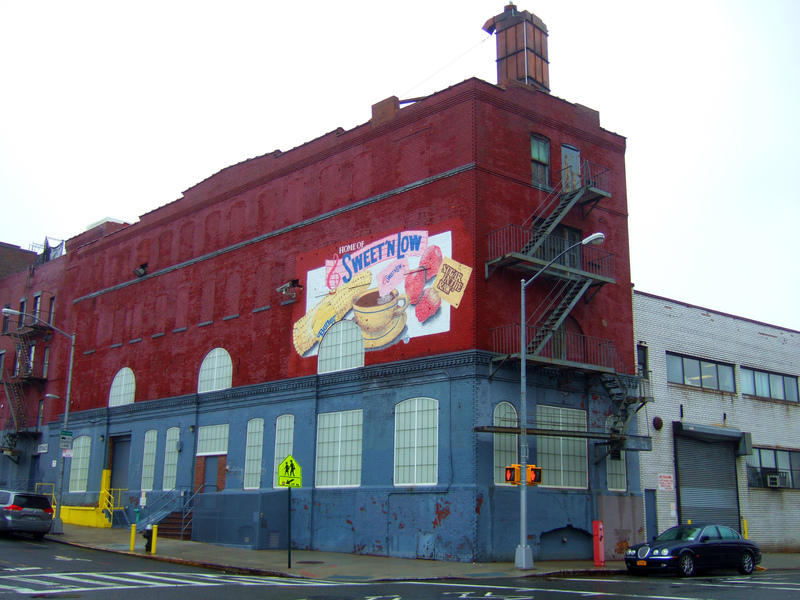 Much more about the fascinating history of Brooklyn’s own Sweet ‘n Low can be found in the book by the same name . The company, now known as Cumberland Packing, still packs Sweet N’ Low into the bright pink packets on the same corner tenement in Brooklyn; but they’ve also expanded their operations into a massive warehouse on Navy Yard premises. When the Navy Yard was closed as a military base in the 1960s, the area was turned over to industrial development, and Cumberland packing is one of their oldest tenants. I was lucky enough to get a tour of the entire operation. 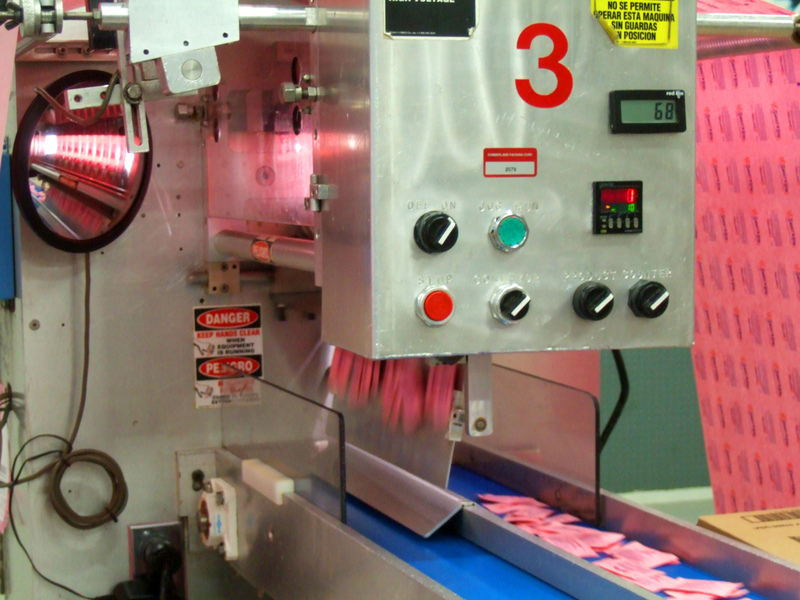 The very first thing I noticed when I entered the Sweet N’ Low packing facilities was that the AIR TASTED SWEET. You can eat the sweet taste right out of the air; you can lick it from your skin; and eventually, I imagine, you can rub it from your eyes and cough it up from your lungs. It is everywhere–and so is PINK, so much pink! Sweet pinkness everywhere you look. The Sweet N’ Low packing plant was on an intimate scale, shorts hallways and narrow stairs winding between converted rooms in the old building; each space has less than a dozen machines each manned by an operator. 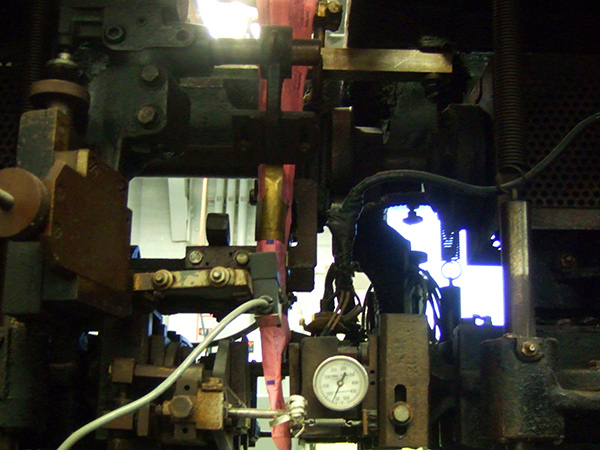 We saw a machine that had been working since the 1940s, a twisted mass of steam-punk pipes, levers, cranks and dials that was now used for custom jobs (the packets in the machine on that day were for a 50th wedding anniversary). Across the way, inside the Navy Yard, Cumberland owns two more buildings were it processes its other products, including the Sugar in the Raw brand. 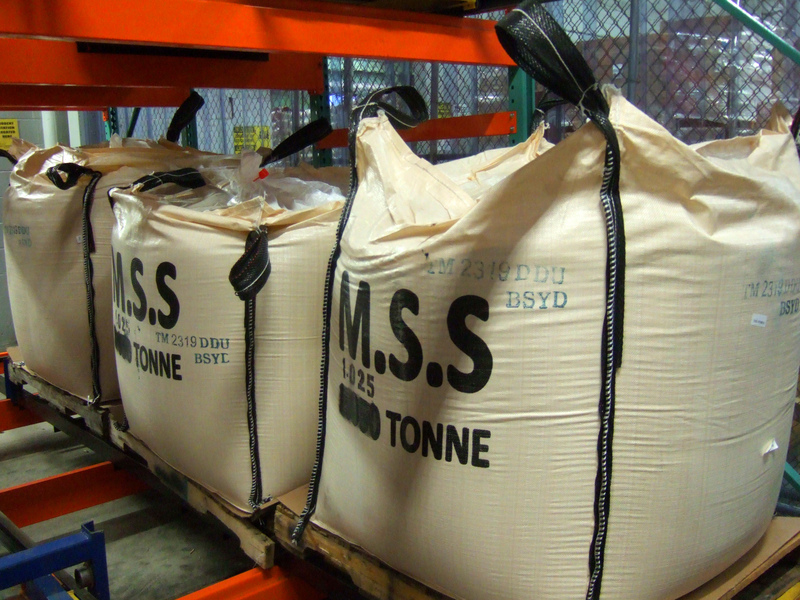 The turbinado sugar is shipped in from all over the world: on the day I was there, enormous bags arrived from Maui and Columbia. The sugars aren’t blended when they are packaged; every packet of Sugar in the Raw is “single origin sugar.” Each packet is a taste of Maui, or Columbia, or etc. 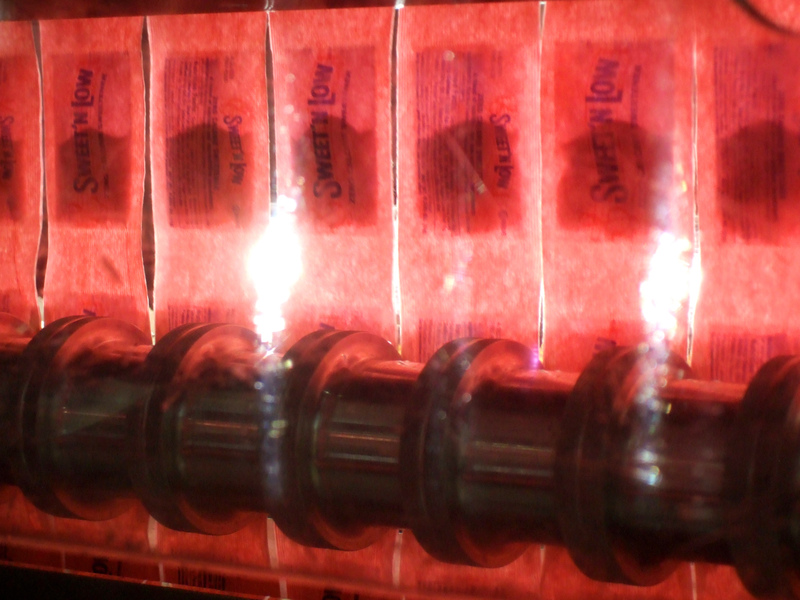 I also saw immense machines that package their newest low calorie sweeteners, Stevia in the Raw and Monk Fruit in the Raw. Over 3,000 packets whizzed by, the enormous robots manned by a handful of individuals. 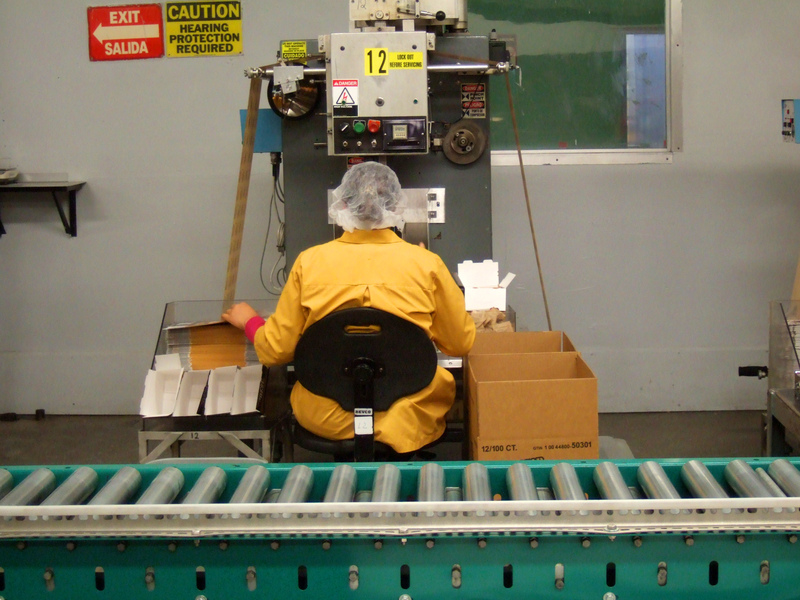 I asked what the advantage the smaller, human powered machines had over the goliath automated packers–was it more economical for a smaller job? The answer was no; these employees had been working for Cumberland for 30 or 40 years, and Cumberland refused to downsize their jobs. They could replace most of their workforce with machines, but don’t out of a sense of responsibility to the community. While anyone can appreciate Cumberland’s loyalty to its workers, it also made me feel a little funny. I thought of the twisted mechanics of the 1940s packing machine I had seen, an antique in a factory where super robots process over 3,000 bags a minute. The people here were also antiques: held on to out of devotion and nostalgia rather than efficiency. What does it feel like to work a job where you know you’re not needed? It made we wonder if there wasn’t a different solution: not to keep these out of date manufacturing jobs in place, but to use that same money to provide the people of the neighborhood with training and education that allows them access to jobs that better use their bodies, minds, and spirits. But those are just my thoughts as an outside observer. A huge part of Navy Yard’s goals for the future is to continue to provide employment for the people who live in the neighborhood now, in the face of a rapidly changing city. 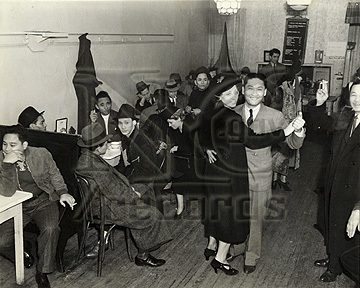 The Manila Restaurant on 47 Sands St, Brooklyn, NY, 1938. This photo used to be available for licensing through NYC.gov, but I can no longer locate it. So here it is in all its watermarked glory. It was fancier than I had wanted, but when my husband and I cozied up to the bar, I noticed that the menu included a dish that four people had insisted I try: balut. “All this yelling for an egg? ?” his wife asked in laughing disbelief. Balut is a fertilized duck egg: you crack the egg to find a half-developed bird fetus, swimming in briny broth. Food gives comfort when we long for home. It’s all the good parts of where we come from and none of the reasons why we left. This is as true today as it was in the 1930s, when a thriving Filipino population found their home just outside of the Brooklyn Navy Yard. The Phillipines fell under American occupation shortly after the Spanish-American war. The result was an increased American military population on the islands, but also an increase in Filipino immigration to the United States. Many young Filipino men joined the Navy, for economic opportunity as well as adventure, particularly as the nation geared up for World War II. Many of these recruits ended up at the Brooklyn Navy Yard; by the 1940s, The Navy Yard had over 70,000 employees, and was a key military base and constructed such infamous ships as the USS Missouri. Washington Street & Sands Street, 1930. Source. A pungent sauce, produced in California by a Korean immigrant of Chinese descent, intended for Thai consumers. A sauce that has somehow crossed over into the American mainstream, popular enough to merit its own potato chip flavor. 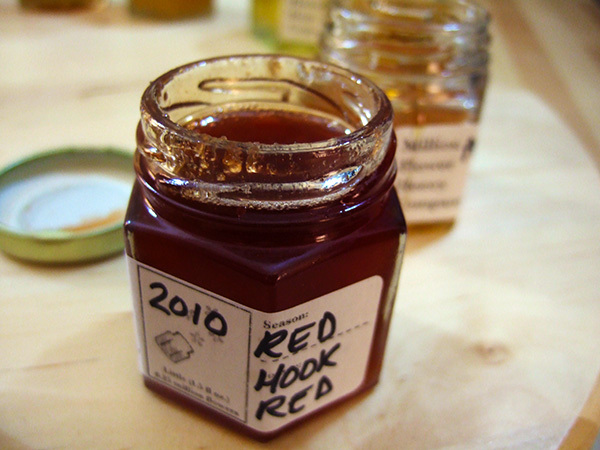 That is Rooster Sauce–as American as apple pie. In the class, we’ll explore the fascinating history of Sriracha and you’ll learn how to make your own version of this spicy sauce. Then, we’ll go beyond Pho and explore the versatility of Sriracha by taste-testing some unexpected flavor combinations. I’m also teaching Homemade Ice Cream Class at the Brooklyn Brainery on Thursday, August 15th, 8:30-10PM. Sign up here! Image from Gourmet.com, from a 2008 article that postulates ambergris might be the next big flavor. 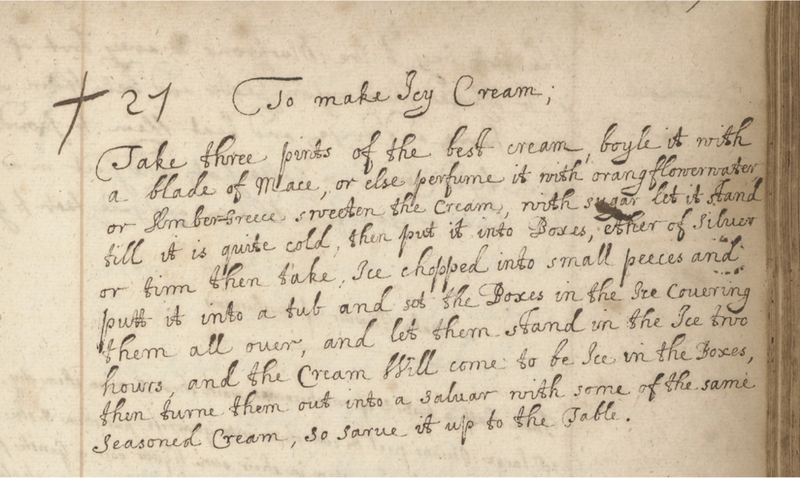 Food historian Ivan Day has discovered what is believed to be the first recipe for ice cream, written in a manuscript by Lady Anne Fanshawe of England. Dating to c. 1665, she flavors her ice cream with mace, orangeflower water, or ambergris. Ambergris is an “intestinal slurry,” believed to be a ball of muscus-covered, indigestible squid beaks. This mass is ejected into the oceans by sperm whales, much like a cat disgorging a hairball. A ball of ambergris floats in the sea until it washes ashore and is collected. Throughout the 18th century, it was a prized flavoring for sweets and today it is still valued today as a base for perfumes. Its smell and flavor can range from “earthy to musky to sweet.” At the current Whales: Giants of the Deep exhibit at the American Museum of Natural History, you are encourage to sniff a large ball of very valuable whale puke. I needed to known what ambergris ice cream tasted like. Ambergris is very, very expensive: it will run you about $25 per gram. 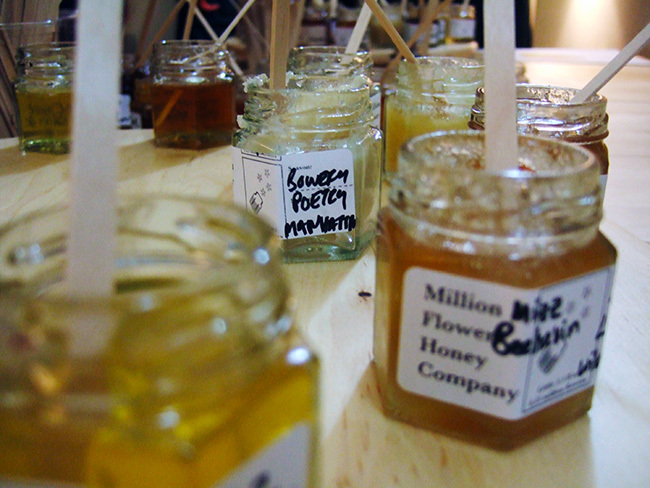 There are more affordable, essential oils made from it, but often they are labeled “not for consumption.” I searched far and wide and finally found Dewberry’s Herbal, an Etsy shop stocked with handmade essential oils that even let you choose which oil base you want. 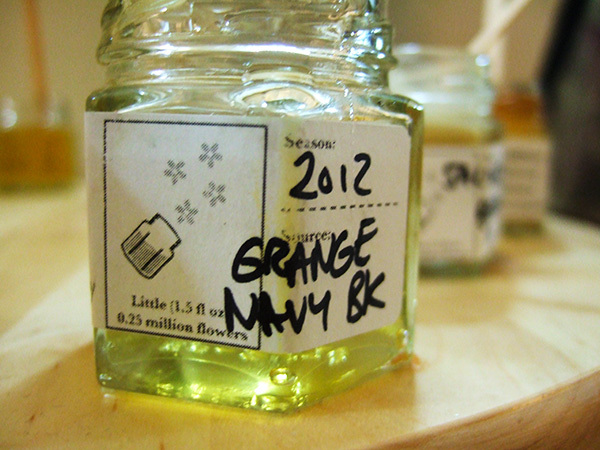 I picked the “True Ambergris” with grapeseed oil, the most neutral of oils! I have been psyched for this experiment for weeks! …And the end of the story is the ambergris got lost in the mail. Or, stolen from the foyer of my apartment building. It is no where to be found–and I’m crushed. To be continued…when I can work out the insurance claim, or scrape together money to by some more, Ambergris Ice Cream will happen! Coarse leaves of lapsang souchong tea. Photo by Selva. You may have noticed the trend, in the fancy ice cream freezer at the grocery store, for bright green pints of “Green Tea Ice Cream.” The color, and flavor, comes from matcha, the green tea powder that is traditionally used in Japanese tea ceremonies. Although the use of matcha in confections is recent, the idea of tea-flavored ice cream is quite old. Drinks, like tea, coffee, and “hot” chocolate, were some of the earliest ice cream flavors, first appearing in the 18th century. This recipe for Howqua’s-Tea Ice Cream, from The Ice Book, 1844, particularly captured my imagination. Who’s this Howqua dude? Wu Ping-Chien, known as Howqua or Ho-Kwa in the West, was a Mandarin trader in the early 19th century. His family business worked heavily with England and the United States and by the time of the Opium War, Howqua was one of the richest men on the planet. Known for the fine quality of his products, his famous name was often appropriated to lend inferior brands of tea an air of luxury. The name was often given to black tea blends, known to have a “delicious fragrant aroma” or a “peculiar flavor.” Some brands seem to have gotten their unique taste from orange pekoe tea; while other relied on lapsang souchong. Lapsang souchong is made from course tea leaves plucked far away from the “bud” of the tea plant. These leaves lack aromatic compounds and therefore flavor. 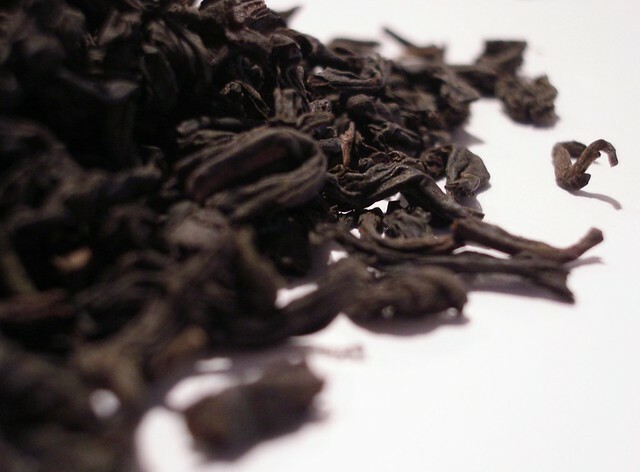 To compensate, the leaves are dried over a smokey pine fire, resulting in a rich, black tea with a dark, smoked flavor. I thought a smokey black tea might make for an interesting ice cream, so I tried it out. I used my standard custard ice cream recipe (below) and infused the milk and cream with 1/4 cup of loose leaf lapsang souchong tea. The results? I swear to god it tasted just like bacon. It’s vegetarian bacon ice cream, with a flavor more subtle and complex than squirting liquid smoke into everything (the method often used to create “fake” bacon flavor). Was it any good? Debatable. But it seems like the technique could be expanded upon and taken advantage of. Give it a whirl and let me know how it goes. 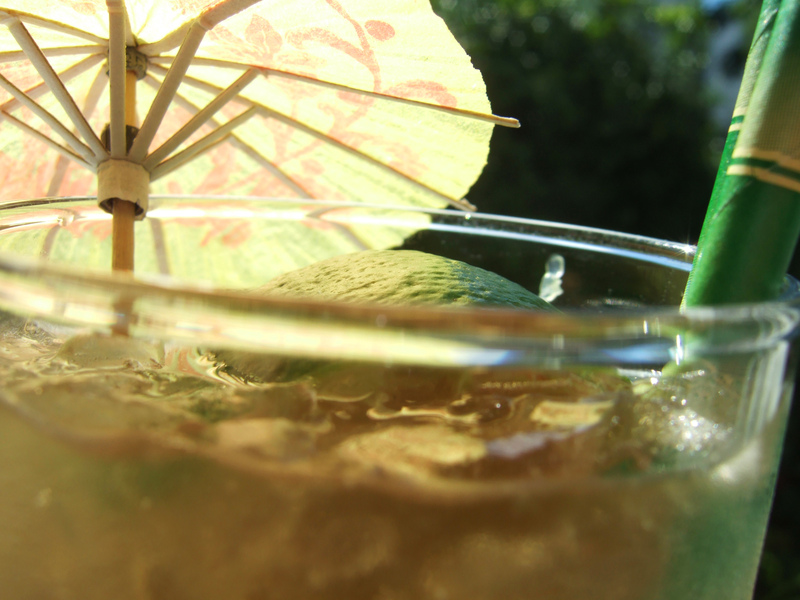 A Frankenstein combination of recipes from Thomas Jefferson, Martha Stewart, and Alton Brown. I learned about Howqua’s Ice Cream from Ivan Day’s Ice Cream: A History (Shire Library) , a slim book packed with information and images about ice cream history. 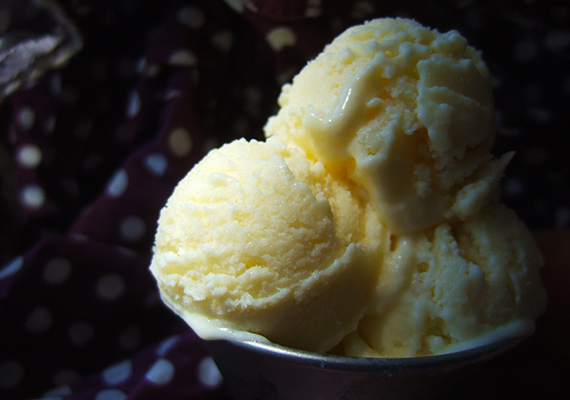 A dish of parmesan ice cream. In this month’s Etsy Kitchen History, I explore historic flavors of ice cream (musk! ), ice cream molds (roast chicken! ), and attempt a fascinating 18th century recipes for Parmesan ice cream. In the 1780s, King Ferdinand IV of Naples and his wife arrived at the San Gregorio Convent to find “…a table covered, and every appearance of a most plentiful cold repast, consisting of several joints of meat, hams, fowl, fish and various other dishes.” The King and his entourage were bummed, however, because they had just eaten. But not wanting to seem impolite, they sat down, and Queen Maria Carolina “…choose a slice of cold turkey, which, on being cut up, turned out a large piece of lemon ice. All the other dishes were ices of various kinds, disguised under the forms of joints of meat, fish and fowl.” The King and the nuns alike had a hearty laugh at the joke. Read more on Etsy here! And on Four Pounds Flour this week, I’ll be posting about two more unique historic flavors: ambergris and lapsang souchong.